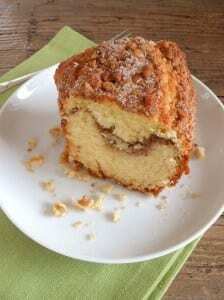 A Simple Easy Cinnamon Cake, fast, easy and delicious, a soft full of cinnamon cake recipe. 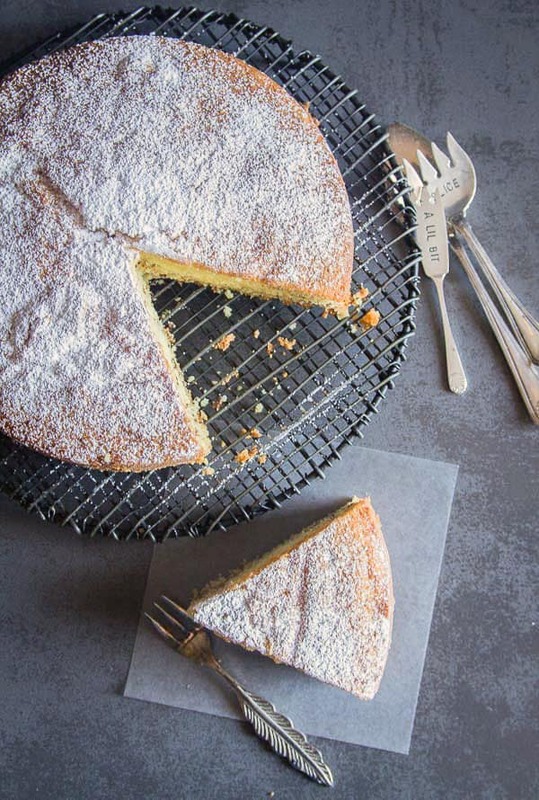 The perfect anytime cake, from Breakfast, to Snack or Dessert. I must admit I have been dying to post this recipe. I’ve been making this cinnamon cake for at least 20 years! And where did I get it from? Obviously my mother, she was and still is with me through the handwritten recipes she left me. My mother is probably my main source for my Non Italian dessert recipes, because holy cow could my mother bake! I remember coming home from school when I was a kid and there would be cookie sheets filled with all her wonderful Christmas Cookies and bars just waiting to be eaten during the holidays. Nobody could make those cookies like my Mom could. 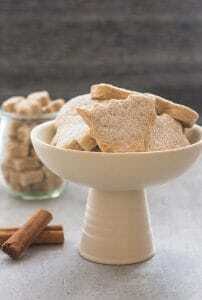 She would fill cookie tins full of these delicacies and put them in the freezer. But that never stopped us, I used to think if I sneaked down and took a few who would notice? But seriously, who are we kidding? We are talking about mothers, they notice everything. My husband even admits to sneaking down and taking a few himself. Good times and good memories. Moving on to this Simple Easy Cinnamon Cake. Ahhh the smell of cinnamon baking in the oven has to be one of my favourite aromas. 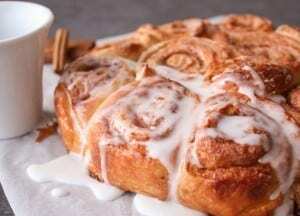 More Cinnamon Recipes to enjoy! If there was one cake that I could eat all by myself this would be the one, Cinnamon Cake. I can’t tell you how delicious this cake really is. Easy and fast to put together and that amazing smell wafting through the house. 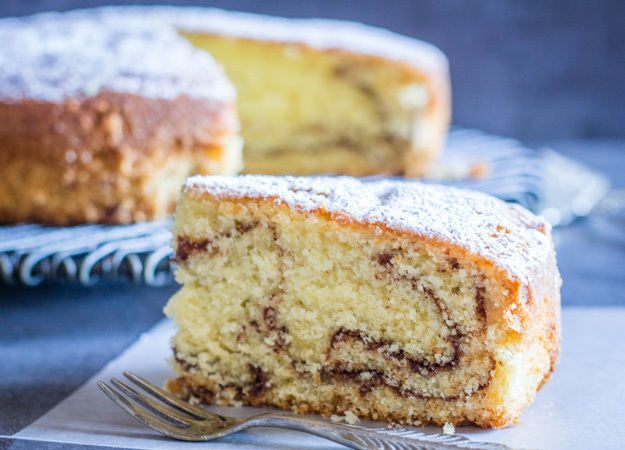 Soft, moist and cinnamony and so totally perfect with a cup of tea or coffee, one slice, two or three slices, who cares, who’s counting? Enjoy! 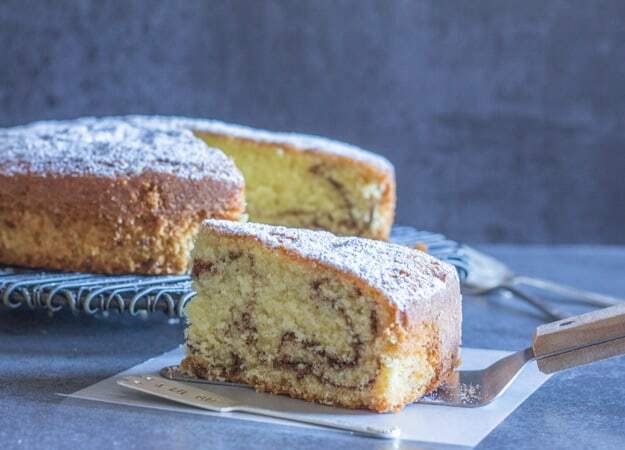 Simple Easy Cinnamon Cake, a soft, delicious and moist Cake Recipe. 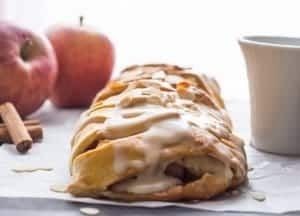 Perfect for snack, dessert or even Breakfast. Everyone will love it. In a small bowl mix together brown sugar and cinnamon, set aside. In a large bowl cream butter and sugar, then add the eggs, beat until fluffy. In a medium bowl sift together flour,baking powder, baking soda and salt. Add dry ingredients alternately with sour milk, ending with sour milk to creamed mixture. Add vanilla and mix well. Spoon 1/3 of the batter into a greased 8" (20.5 centimeter) springform pan. Sprinkle with 1/2 of the cinnamon mixture. Spoon another 1/3 of the batter on top, then remaining cinnamon mixture and then top with the remaining batter. Bake for approximately 50-60 minutes or until toothpick comes out clean and dry. Remove from oven and let cool. Enjoy! Updated from October 5, 2014. Hi Rosemary, amazing cake. For the cinnamon mixture, Am I using soft light brown sugar (which doesn’t have much grain) or granulated brown sugar? Hi Roxanne, I usually use a the soft light brown sugar. Let me know how it goes. I have followed the recipe to the tee but mine doesn’t rise and is flat? I used a 22inch springform as can’t find a 20. Would that make the difference? Hi Olivia, I think you mean 22 cm correct? An 8 inch pan would work. Have you checked to make sure your baking powder hasn’t expired or that your oven temperature is correct? And be sure to cream the butter and sugar (about 2 – 3 minutes). Hope that helps. 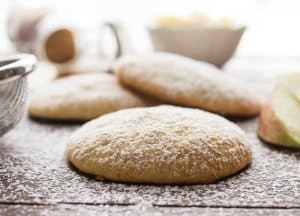 A couple months ago after work trips to Italy I was searching for Italian cookie recipes and I stumbled on this recipe somehow. I bookmarked it and made it this morning. It is SOOOOOOOO GOOD. 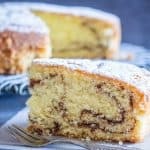 My husband and I both thought it would also be good with a cinnamon streusel topping on it – I’ll be trying that next time! Thanks Mrs Rosemary! I hardly know how to start an oven but I made this cake for my team and we all had it with vanilla ice cream, it was awesome! The wives were all bamboozled how I could bake! Keep spreading the good word! Hi Anurag, thanks so much so glad you and your team enjoyed the cake. Have a great weekend. This is one of the best cakes I have ever baked! Thank you for giving my family a new recipe that will likely live on for generations! Hi Brittany thanks so much, so glad you and your family enjoyed it. Have a wonderful weekend. Would it be ok if I used granuleted sugar instead of brown sugar? Hi Mary well you could, but the brown sugar gives a slight caramel taste and it helps make the cake moister and softer. I hope that helps, if you do use regular white sugar, let me know how it goes. Hi, I have a few questions about this cake. I just made it and was very underwhelmed by it. I used all ingredients you mentioned. My “sour milk” was just actual milk that had soured slightly. My brown sugar was lumpy out of the bag (so maybe too dry?). I did let my butter and eggs both come to room temperature. I creamed the sugar (granulated unbleached organic cane sugar) and butter. I added the eggs next, then alternately the dry ingredients and sour milk like you said. I am trying to figure out why this cake turned out so dry, and even a bit grainy. The flavor was also “meh.”. I will eat this with coffee in the morning for the rest of this week but I can’t see myself ever wanting to make this again. Please let me know if there’s a reason why the moisture content and flavor was so underwhelming for me. Hi Kate, sorry it didn’t turn out for you, but I’m going to say it could be because you didn’t use regular brown sugar (which has molasses in it) and helps with making a cake moist. Also when sugar is lumpy you really should break it up, to take out the lumps. And I think you may have baked it too long. Hope this helps. Can I replace butter with vegetable oil? Hi Coco, not really because you have to cream the butter and the sugar and you can’t cream vegetable oil. Can I use heavy cream instead of sour milk for this recipe? Hi Kaitlin, you can try although I have never made it with heavy cream, it will be extremely rich though, you may want to cut back a bit on the butter and add a little water. Im just guessing but try less 1/4 cup butter and add 1/4 cup water. Hope that helps. Let me know. Heyyy! In this recipe does vanilla means vanilla essence? I’m too excited to try this recipe. Hi Mahrukh yes it’s vanilla extract. I hope you enjoy it, let me know. Can i bake this in a bundt cake pan? Hi Louise, I think it would work fine in a bundt pan. Let me know how it goes. I’m eating a slice of this cake right now! I made it last night (also made some fresh whipped cream for it). But realized (after I’d already started putting batter in) that my springform pan was probably 10″! I only had enough batter for one layer of cinnamon, so I put the rest of the cinnamon on top. I figured this was going to come out of the oven looking like an over cooked pancake since my pan was clearly too big. I shortened my cook time & checked with a toothpick. I was really surprised it rose nicely and looked like an actual cake. AND IT’S DELICIOUS! It’s like the perfect little cake for any time. Thanks for sharing this simple, easy, and super yummy cake recipe! Hi Christine, so glad you enjoyed it and it worked out. I love cinnamon so whenever I feel like something cinnamon this cake is it. And I agree great anytime. Thanks and have a wonderful weekend. I made this exactly as written, except with unsweetened ALMOND MILK (plus the lemon juice for sourness). It turned out perfectly, even without adjustments for my moderately high altitude (5300 ft). So quick and easy for a last-minute cake craving. 🙂 Thanks for the recipe. Hi, just wondering if I could substitute coconut milk for the milk in this recipe? Hi Bakinglady, I really don’t know, I have never baked with coconut milk before, but apparently you can. You could try it and see how it goes let me know. Have a great weekend. This recipe is the bomb. I am not joking. I made this for a potluck and all I got was crumbs. And rave reviews. Everyone LOVED it. My little didn’t even get a peice so I have to make this again for the kid. Thank you SO much for this simple yet, amazing recipe! Hi Sarah, thanks so glad everyone liked it. And glad you are making it again for your kid. 🙂 My kids love it too. Have a wonderful Sunday. I made this cake 2 days ago. It came out so good !!! I try to eat gluten free but love to bake for friends. Since baking gluten free is a challenge I bake also regular stuff and try not to eat it. But this cake I could not resist the temptation!!! So I had a nice piece, and a second one….and oh boy.Did I enjoy it? Big time…no regrets!!! Thank you for such a wordeful recipe. I increased the amount of cinnamon mix to use as a topping with chopped pecans. It looked sooo beautiful and the flavor….AMAZING!! Hi Yolly, so glad you enjoyed the cake, (even if it isn’t gluten free). And that topping sounds delicious. Have a great week. 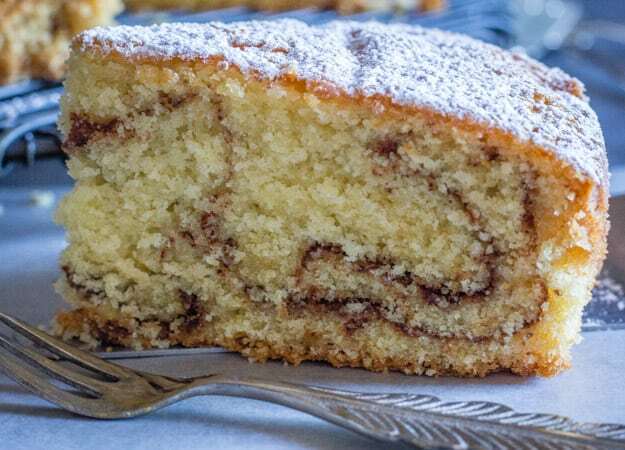 Hi, looking forward to making this cake, but can’t seem to find the recipe for the cinnamon mixture! Could you help please? Thanks. Hi Rose, can i use light brown sugar instead of regular? Hi Amrita, sure that would be fine. Hope you enjoy it, let me know. Have a great weekend. I am a greek fun of you. I like your recipes a lot but this one was love at first sight. I love cinnamon very much! I made it with greek yoghurt! and inches or cm! You can’t find recipes this way on other blogs!!! Hi Dora, thanks so much. I love every cinnamon too! So glad you enjoyed it. Have a wonderful weekend. I am kind of a beginner baker… never made anything other than simple pound cake. Have a question which might be stupid… why sour milk? Why not regular whole milk or skimmed milk/ Would sour milk make the cake lighter? Or is it meant to give a different flavour? I cant buy sour milk in my city. I expect if I just leave milk and lime juice in a cup, milk will separate into solid and liquid. Will that blend into the batter properly? Just made this and it came out amazing! I actually cut the reciepe in half, due to only having one cup of flour available. I also had some cinnamon frosting left over, from a recent cina-cupcake experiment. After baking, I split the cake in half, horizontally, and added a layer of frosting in between, as well as on top. It looked a little fancy and tasted absolutely delish!!!!!! Hi Alex, so glad you enjoyed it and great idea with the frosting. Happy New Year. 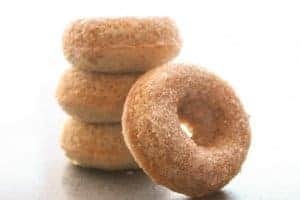 Can I use granulated sugar instead of brown sugar? 2) I didn’t get the sour milk content. It says top off with milk.. can u please explain to me again? I’m making this recipe for the first time. Saw the video but I was unable could not get the sour milk content..
Hi Swetha You could substitute with granulated sugar (for the topping) although the brown sugar does give it a bit of a caramelized taste. Ok so for the sour milk, take a one cup measurement add 1 tablespoon of lemon juice and add enough milk to make one cup. Hope that helps. Let me know how it goes. Happy New Year. What is the cream measurement? Hi Swetha, cream butter and sugar is a cooking term which means you have to beat the butter and sugar until creamy. Hope that helps. I want to make this for our Christmas Eve dinner. I am wondering if I can use a regular cake pan instead of spring form? I have a 9 inch. How would I need to modify the recipe? Just cook it less time? Hi Jennifer, sure a regular cake pan is fine and yes I would start to check it at about 35-40 minutes. Hope that helps. Merry Christmas. Hi Veronica, well I wouldn’t say love lol, but I am quite used to it after all these years, but I do love going home. Ps I always wanted to live in the UK. 🙂 Hope you are at home there. Hi Veronica, I would double the recipe for the 8 inch tins, I don’t thing the buttercream will be too heavy (sounds delicious). But I can’t tell you about substituting the flour, because I have only made it with all purpose. Sorry. and no problem with the questions. Let me know how it goes. Sounds amazing. Merry Christmas. ps remember not to cut out the cookies too thin. This cake looks so scrumptious. I like the simple soft look of the cake. In my experience Cinnamon is not not a common flavor for a cake and thus makes it a fascinating recipe to try out. I added this cake as a last minute addition to our Thanksgiving dessert table. HUGE hit!!! So moist and tender. Everyone loved it, even me. I am not a huge fan of cinnamon, but this cake was delicious. Paired it with a little homemade whipped cream and it was perfection. Even better for breakfast the next morning with a cup of tea. Thanks for sharing another great recipe. I made this cake a few days ago and it was so delicious! That is even with forgetting to add the vanilla. I will be saving this recipe for future use. Thanks for sharing. Hi Michelle, so glad you enjoyed it. and your welcome. I tried it two days ago for a work party and it turned out so good. It was very quick to put together, although I baked it for an hour and covered it with aluminium foil half way into baking to avoid it from getting too dark. I loved it so much that I saved this recipe and it is going in my recipe box. Thank you Rose. Hi Maahi, so glad you enjoyed it. Yes I find sometimes baking in my oven is quicker for some reason. Have a great weekend. I will be making this for my dad’s bday. Can I use lowfat milk? and do you swirl the cinnamon? Thx!! Hi Christine, low fat milk should be fine, and no I didn’t swirl it. Hope your Dad likes it and has a wonderful Birthday. I made this today as I was having company over. Again, another great recipe! Thank you. Hi Steph thanks so much, so glad you enjoyed it. Have a great week. Your cinnamon cake look so delicious! I’ve never tried making cinnamon cake before, but after reading your recipe I feel like I have to. Thank you for sharing! Hi Pavitra, thanks I hope you enjoy it. I’m so happy I found this recipe. I am not a great baker and rarely make any desserts for my family but this cake came out sooooooo good. I’m serving it with vanilla ice-cream. Oh, and I substituted the sour milk with plain yogurt. Thank you ! This is the second time I am using this recipe and it’s always been deliscous, love the cheat with the sour milk as I always forget to get one so I use lemon. Hi Eshika, thanks so much and yes it is pretty popular in our house. Absolutely amazing!! Loved it. I used 3 Indian sized eggs and thick curd instead of sour milk, though. The fluffiness and the cinnamon swirls in between are amazing! Thank you so much for sharing the recipe. God bless you! Hi Prahrithi, thanks so much glad you enjoyed it. Hi Rosemary, This is the most awesome non chocolate cake I have eaten!! Thank you so so much for sharing it here and I can’t thank my stars enough that I found your page! I am from India , I used three eggs instead of 2 as the eggs available are smaller here, and I replaced sour milk with thick yogurt, but the cake looks perfect! 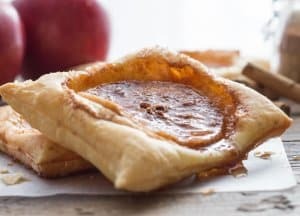 The cinnamon with brown sugar sprinkle HAS to be the best touch to this simple, subtle and awesome recipe! Again, thank you tons and God bless! Definitely making this for the kids when they get home from school. Thanks for another great recipe. Thanks Ann hope you all enjoy it. What type of flour should you use? Plain flour or self raising flour? Hi Shamima, just regular all purpose flour. Hope you enjoy it. Have a great weekend. I was really worried that the batter was too slack, and I couldn’t make sour milk and used regular, but I shouldn’t have doubted – it’s come out of the oven looking perfect! Hi Chrissy, so glad you enjoyed it. Have a great weekend. Please would you explain step 5. I don’t understand it and don’t want to make a mistake thanks. Are you stating to add sour cream to the flour ingredients and then add all to creamed mixture? Hi Nas, what you have to do is starting with the sour milk, had a little to the creamed mixture, then add a little of the dry mixture to the creamed mixture and continue for 3 times (ending with the sour milk), then add the vanilla and combine all together. Hope that helps. delicious! i made this today, and it really is so soft and yummy. followed the recipe pretty closely, except that it took only 45 minutes. great cake! Hi Alison, thanks so glad you enjoyed it. Happy New Year. Thank you for sharing these recipes, I am so looking foward to trying them. Thank you to your Mom???????????? Hi Josie, thank you, my Mom would have been so happy to hear that. Have a great day! Hello! I saw your cake on Pinterest and had to check it out. This cake looks so tender. I can’t wait to give it a try. Hi . How can I make sour milk using regular milk? Hi Alizay, in the ingredients for the cake it says 1 cup sour milk and beside it in brackets I wrote how to make sour milk. (add 1 tablespoon lemon juice to a 1 cup measure and top off with milk, let sit for about 10-15 minutes). Really easy, hope you enjoy the cake. Thanks. HI Dawn, thank you, this is my absolute favorite cake ever! I love cinnamon! Hope you like it too. This cake looks amazing! I remember baking with my mom around the holidays too… such good memories 🙂 Thank you for linking up to Creative K Kids Tasty Tuesdays. I’ll be pinning this to the Tasty Tuesdays Pinterest Board. Hope you are having a great weekend! Thank you for the pin and great memories they are! Have a great Sunday! This looks delicious. Pinned to try! Hi Holly, thank you very much. Have a great day! Hello Mary, no actually I have made it in various pans, just make sure it is at least a 9″ pan and it is from 2-3 inches deep. I’m sure a loaf pan would work too. Have a great day. Thanks for this recipe. Can I use buttermilk instead if sour milk? Hi Alma, to be honest I really don’t know since I can’t get buttermilk here in Italy, so I have never baked with buttermilk, but I did google it and it seems you can substitute buttermilk for sour milk. So if you do try it let me know how it turned out. Have a great day!